Pre-heat oven to 180°C/350°F. Add flour, cocoa, cinnamon, bananas, and melted coconut oil to a bowl. Use an immersion blender to mix until a smooth batter forms. Add eggs and chopped dark chocolate and stir to combine. Add baking powder and apple cider vinegar to the batter and form a smooth dough. 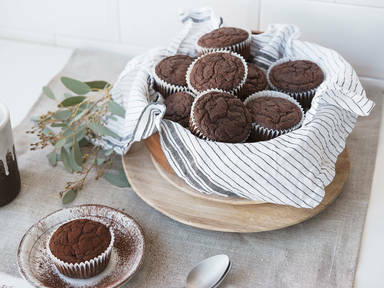 Use an ice cream scoop to add an equal amount of dough to each muffin liner. Bake with convection heat at 180°C/3560F for approx. 20 min. Let cool completely, then dust with cocoa powder before serving. Enjoy!